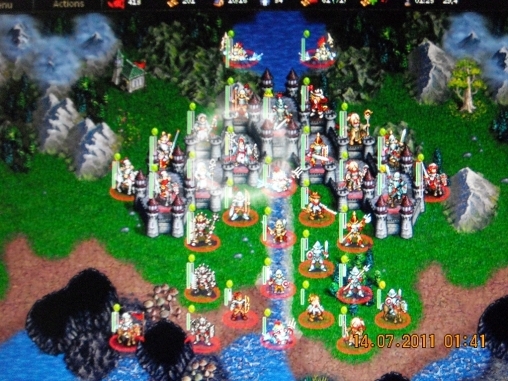 Battle for Wesnoth is a battle game where beings of different races fight with other races. In fact, beings of different races can also team up with each other to fight other groups of beings which may be of same race or teams of different races. There are 6 types of race. Human, Elf, Dwarf, Undead, Orcs, Dragon / Drake. These different races have different traits and capabitilies. Sometimes, one race for example Human, can recruit other races for example Elf, because in that story, they are allies. This software comes with some story lines. Every story line has different difficulty level which is fixed such as Novice, Intermediate or Expert. After choosing a story line, you will be asked to select the game's difficulty level such as beginners, normal and challenging. This game difficulty level is different from the story line difficulty level. Each story line has different number of stages (this software calls it scenarios. 1 scenario, 1 map). At start of every scenario, you will be asked to recruit units for your army or recall the old units that won the previous scenarios in the story line with all their increase ranks. The selection of recruits depends on the difficulty of the game together with the story line difficulty. To select or recruit units, golds are required. Some starts with some gold in hand, some none. Gold can increase or decrease with every change of turns depending on the + and - sign beside the gold icon. Sick / hurt units can go to house to recover or stand next to a mage, sharman or those with healing capabilities. When a unit is hurt be its opponent, the life-level will drop and it will die when the life-level reaches zero. The life-level may be different for the same type of recruit (example, NOT all Mages have the same life-level). The difference for a same type of recruit might be as big as 10 HP. Every unit / recruit in this game has some behaviour and abilities. I would term those behaviour as under traits and capabilities. The life-level that you may get for the same type of unit with the same capabilities may be different from the example I gave you under the individual 'Race' details below. Every type of rank of a race has a different level of life-level, a different level of experience, a different method of attacking opponent using different weapons, a different defence level of defence and a different attacking power. The unit gains level of experience when they kill their opponent. When experience increased to a certain level, the unit will be promoted either automatically or with choice to a higher rank with increase capabilities. The experience-level may be different for the same type of recruit (example, NOT all Mages have the same experience-level). The main objective is to defeat the opponents groups and to complete every stage within time given in the story. The game can end when the opponent army kill your leader(s) or you failed to win within given time where the time is number of turns (if I am not wrong). Battle for Wesnoth, regardless of whether you play single player or multiplayer, has different time of a day. During day time, it has morning, afternoon and evening. During night time, it has dusk, midnight and dawn. This different time in a day affects the outcome of a battle. The difference in the units behaviour will give advantage to certain units depending on the different phases (day or night) of the day. For example, Lawful race performs better during day time, Neutral race is not affect by the time of the day and Chaotic race performs better during night time. 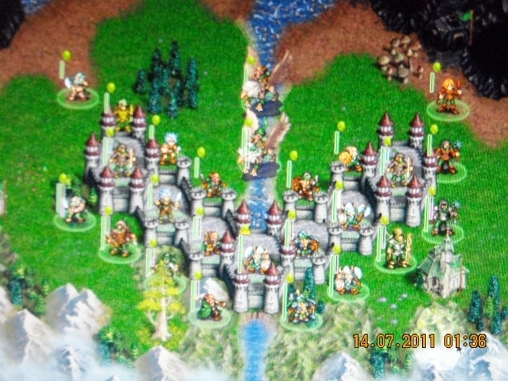 Theif, Poacher, Footpad and their higher ranking units which are allied with Dwarf are CHAOTIC. 2. Elf : all unit types regardless of ranks are NEUTRAL. 4. Undead : all unit types regardless of ranks are CHAOTIC, including their allies such as Bat race (Vampire Bat, Blood Bat and Dread Bat). 5. Orc : all unit types regardless of ranks are CHAOTIC, including their allies such as Wolf and Goblin race (Wolf Rider, Goblin Knight, Goblin Pillager and Direwolf Rider), Troll race (Troll Whelp, Troll, Troll Rocklobber and Troll Warrior). Their ally the Nagani / Naga race (Nagini Fighter, Nagini Warrior and Naga Myrmidon) is NEUTRAL. 6. Drake : all unit types regardless of ranks are LAWFUL. However, its ally, Saurian race is CHAOTIC. 1. Merman : all unit types regardless of ranks are LAWFUL. 2. Gryphon : all unit types regardless of ranks are NEUTRAL. 3. Bat : all unit types regardless of ranks are CHAOTIC. 4. Wolf and Goblin : all unit types regardless of ranks are CHAOTIC. 5. Troll : all unit types regardless of ranks are CHAOTIC. 6. Nagani / Naga : all unit types regardless of ranks are NEUTRAL. 1. Heir to the Throne (Novice, 25 scenarios) : Race = elvish army (player) help human leader (player) against orcs with can ride on wolves and trolls (computer). Elvish army has a selection of recruits called archer, fighter, scout and sharman. 2. Tale of 2 Brothers (Novice, 4 scenarios) : Race = Human (player) protected by elves (computer) against orcs (computer). Human army has a selection of recruits called bowman, horseman, spearman, and footpad. 4. Hammer of Thursagan (Intermediate, 18 scenarios) : Race = Dwarf (player) with help of Gryphon against Orcs. 5. Descent into Darkness (Intermediate, 11 scenarios) : Race = Human (player) and Undead (player) against Orcs. I advise would be players to play those novice or intermediate story lines with fewer scenarios first because it is easier to complete all the scenarios. Choose the beginners level. Even a novice player like I can complete a few storylines. Recently, I went into the expert story line but did not manage to complete any yet. I have tried 'Under The Burning Sun' and 'Sceptre of Fire'. The scenarios that I have completed for 'Sceptre of Fire' are Bargain Is Struck, Closing of Gates, Search for the Runecrafter, Gathering Materials, Hills of Shorbear Clan and Towards the Cave. I could not complete the 'Outriding the Outriders' scenario yet. 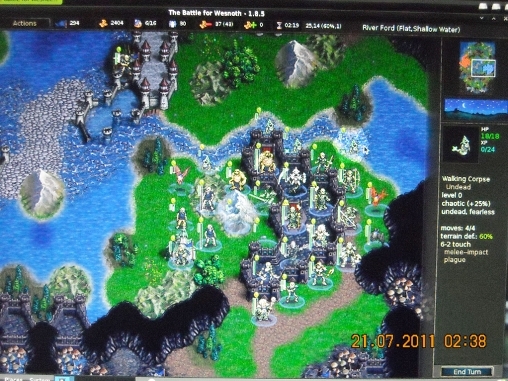 When I first played this game in 2010 using a live DVD with title live.linux-gamers.net, I find it ok. Battle for Wesnoth is a turn-based game. Even playing from the DVD, I could control the movements of every unit of my army. I can control which opponent's unit I want to attack and with what weapon. The the turn will pass to the opponent which can do the same thing. It is a one-to-one fight. The 'computer player' is pretty smart because it knows how to create its own army. A nice attacking and trapping game. 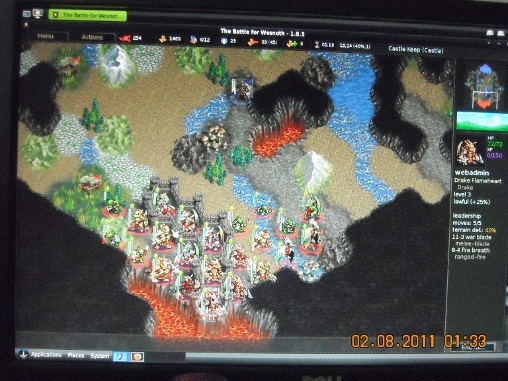 Now, in 2011 using Sabayon 5.4, I found that Battle for Wesnoth has a scenario editor too. This senario editor has many objects to create different types of terrain like flat land, mountain, desert, frozen area, etc. It has many objects to create castle, villages, types of structures. However, I still cannot find character object yet. 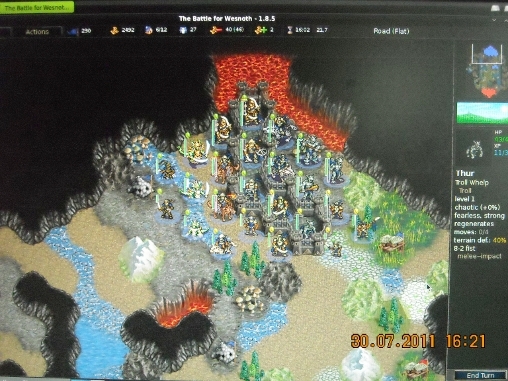 The Battle for Wesnoth software has a Multiplayer selection. In Multiplayer selection, the players have the option to choose the number of gold at the beginning and how many golds are added or deducted for each house the team took over or was taken over by other team. Capabilities as I call them, are the abilities of the type of unit. Some examples of abilities are quick, intelligent, resilient, strong, dextrous, healthy and steadfast for Humans. Abilities for other races may be different or less than what is mentioned here. 1. The Quick capability increases the units ability to move by one point or one hexagon in the map. 2. Intelligent units require less experience to get promoted to a higher rank. I like this capability as it is easier to get higher level units. 3. Resilient and Healthy units have the highest life-points. However, it is very-very difficult to get this combinaton. 4. Resilient and Strong units have the second highest life-points and it is much easier to get. 5. Strong units have a point higher in melee attack. 6. Dextrous units have a point higher in range attack. Intelligent, Resilient, Strong, and Quick are common capabilities of most races (the six main races and a few minority races). Most units have 2 capabilities combined. As I continue trying to get the races particular, I found that centain combinations are better. The best combination that I have found so far is 'Intelligent and Resilient'. However, it is easier for a few unit types of a race to get this capability. For example, I have tried out Drake and Orc and found that it was easier to get intelligent and resilient Darke Burner than Drake Glider. Until now, I find that certain race like Saurian does not have this combination. a) Drakes : intelligent and resilient is the best combination because intelligent dragons required least experience (XP) to be promoted while resilient has the highest life-point (HP) for the dragons. b) Orcs : same as Drakes, intelligent and resilient is the best combination because intelligent Orcs required least experience (XP) to be promoted while resilient increases the life-point (HP) for the Orcs. A few minority races have different capabilities. Trolls have combinations of capabilities but so far, I have not seen an intelligent troll. Goblin has single ability such as Slow, Weak and Dim. a) Troll : Fearless and Resilient Trolls have better / higher life-points. b) Goblin : slow Goblins require less experience (XP) to get promoted and has better / higher life-points. Battle for Wesnoth has a multi player selection. Under the multi player selection, there are 4 options such as Join Official Server, Connect to Server, Host Networked Server and Local Games. I have tried only the Local Site option where there are some one-stage games, meaning one game one scenario. 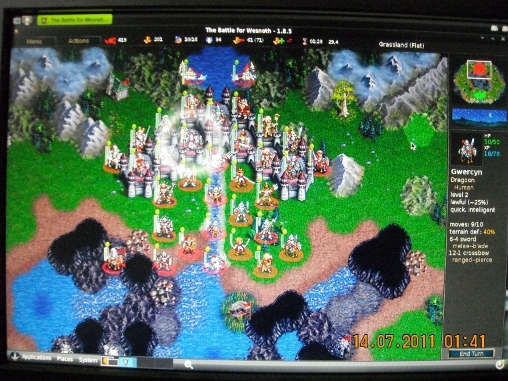 The one-stage games come preset with either 2 players, 3 players, 4 players, 5 players, 6 players, 8 players, 9 players or play against computer. 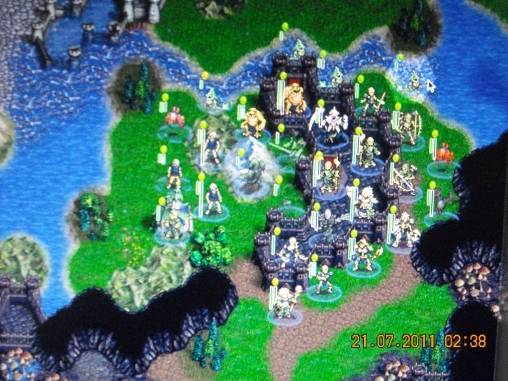 Players have the option to choose the time limit or number of turns they want before they run out of time, whether the map is with fog or without fog, the number of gold you have at the beginning and many others. After choosing a scenario, you can select your own Race, rank and what team you are in. Examples of race options are such as human, elf, dwarf and undead. The examples for options of rank are elf captain and elf socerror for elf race, lietenant or for human race, for dwarf race. If 'player 1' chose 'team 1' and 'player 2' chose 'team 1' too, they would be in the same team. So, they cannot fight against each other. 10. Legend of Wesmere where a player plays with computer and against computer. I like playing the 4p games where 4p stands for 4 players. I put 2 players in a team. When 1 player's leader dies, the game will still continue until all the leaders in the team are dead. Local Games selection for multiplayer is good option to learn to play because you can put unlimited time or moves. It is also a good mode to get to know what each rank can do but it is not as interesting or challenging the story line version where you complete with the computer. I tried The Wilderlands puting each player as its own team. From there, I can slowly try out every race at my own pace. Though it might not be 'real', you can see all the capabilities of all the races' ranks. However, it took more than one day to see all the ranks available and their capabilities for one race. I did not want to continue because I was bored with it. However, it got to complete for one race, the dragon or drake race. 1. Drake Burner required the highest amount of gold (21 golds) to recruit. Its fighting capabilities are melee-blade (claws, 7-2) and ranged-fire (fire breath, 6-4). For capabilities intelligent and resilient, its life-level is about 40 HP. When it reached its required level of experience (about 34 XP), it can become a Level 2 unit, either Drake Flare or Fire Drake. 2. Drake Clasher required the 19 golds to recruit. Its fighting capabilities are melee-blade (war talon, 5-4) and ranged-pierce (spear, 6-4), firststrike. For capabilities intelligent and resilient, its life-level is about 48 HP. When it reached its required level of experience (about 36 XP), it can become a Level 2 unit, either Drake Thrasher or Drake Arbiter. 3. Drake Fighter required the 17 golds to recruit. Its fighting capabilities are melee-blade (war blade, 8-3) and ranged-fire (fire breath, 3-3). For capabilities ... and , its life-level is about ... HP. When it reached its required level of experience (about 34 XP), it can become a Level 2 unit, Drake Warrior. 4. Drade Glider required the 16 golds to recruit. Its fighting capabilities are melee-impact (slam, 6-2) and ranged-fire (fire breath, 3-3), marksman. For capabilities ... and ..., its life-level is about ... HP. When it reached its required level of experience (about 28 XP), it will automatically become a Level 2 unit, Sky Drake. 5. Saurian Augur required the 16 golds to recruit. Saurian Augur is of Saurian race but it is allied with the Drake race. Its fighting capabilities are melee-impact (staff, ) and ranged-cold (curse, ), magic, self healing. For capabilities ... and ..., its life-level is about ... HP. When it reached its required level of experience (about 28 XP), it can become a Level 2 unit, either Saurian Oracle or Saurian Soothsayer. 6. Saurian Skirmisher required the 15 golds to recruit. Saurian Skirmisher is of Saurian race but it is allied with the Drake race. Its fighting capabilities are melee-pierce (spear, 4-4) and ranged-pierce (spear, 4-2). For capabilities intelligent and strong, its life-level is about 27 HP. When it reached its required level of experience (about 26 XP), it can become a Level 2 unit, Saurian Ambusher. 1. Drake Flare is promoted from a level 1 rank, Drake Burner, after Drake Burner had reached about 34 points of experience. Its fighting capabilities are leadership, melee-blade (war blade, 8-3) and ranged-fire (fire breath, 6-4). For capabilities intelligent and resilient, its life-level is about 61 HP. When it reached its required level of experience (about 64 XP), it can become a Level 3 unit, Drake Flameheart. 2. Fire Drake is promoted from a level 1 rank, Drake Burner, after Drake Burner had reached about 34 points of experience. Its fighting capabilities are melee-blade (balltle claws, 9-2) and ranged-fire (fire breath, 7-5). For capabilities intelligent and resilient, its life-level is about 64 HP. When it reached its required level of experience (about 69 XP), it can become a Level 3 unit, Inferno Drake. 3. Drake Thrasher is promoted from a level 1 rank, Drake Clasher, after Drake Clasher had reached about 36 points of experience. Its fighting capabilities are melee-blade (war talon, 8-4), melee-pierce (spear, 6-5) and melee-impact (ram, 10-3). For capabilities ... and , its life-level is about 63 HP. When it reached its required level of experience (about 76 XP), it can become a Level 3 unit, Drake Enforcer. 4. Drake Arbiter is promoted from a level 1 rank, Drake Clasher, after Drake Clasher had reached about 36 points of experience. Its fighting capabilities are melee-blade (halberd, 11-3) and melee-pierce (halberd, 17-2), firststrike. For capabilities ... and , its life-level is about 59 HP. When it reached its required level of experience (about 84 XP), it can become a Level 3 unit, Drake Warden. 5. Drake Warrior is promoted from a level 1 rank, Drake Fighter, after the Drake Fighter had reached about 34 points of experience. Its fighting capabilities are melee-blade (war blade, 12-3) and ranged-fire (fire breath, 5-3). For capabilities ... and , its life-level is about ... HP. When it reached its required level of experience (about 56 XP), it can become a Level 3 unit, Drake Blademaster. 6. Sky Drake is promoted from a level 1 rank, Drake Glider, after Drake Glider had reached about 28 points of experience. Its fighting capabilities are melee-impact (slam, 7-3) and ranged-fire (fire breath, 5-3), marksman. For capabilities intelligent and resilient, its life-level is about 51 HP. When it reached its required level of experience (about 64 XP), it can become a Level 3 unit, Hurricane Drake. 7. Saurian Oracle is promoted from a level 1 rank, Saurian Augur, after the Saurian Augur had reached about points of experience. Saurian Oracle is of Saurian race but it is allied with the Drake race. Its fighting capabilities are melee-impact (staff, 5-3) and ranged-cold (curse, 8-3), magical. Its other capability is healing + 4 for all its group units standing next to it. Saurian Oracle does not have level 3 rank. For capabilities ... and , its life-level is about ... HP and has about XP. 8. Saurian Soothsayer is promoted from a level 1 rank, Saurian Augur, after the Saurian Augur had reached about points of experience. Saurian Soothsayer is of Saurian race but it is allied with the Drake race. Its fighting capabilities are melee-impact (staff, 5-2) and ranged-cold (curse, 6-3), magical. Its other capabilities are curing and healing + 8 for all its group units standing next to it. Saurian Soothsayer does not have level 3 rank. For capabilities ... and , its life-level is about ... HP and has about XP. 9. Saurian Ambusher is promoted from a level 1 rank, Saurian Skirmisher, after the Saurian Skirmisher had reached about 26 points of experience. Saurian Ambusher is of Saurian race but it is allied with the Drake race. Its fighting capabilities are melee-pierce (spear, 7-4) and ranged-pierce (spear, 5-2). For capabilities intelligent and strong, its life-level is about 37 HP. When it reached its required level of experience (about 44 XP), it can become a Level 3 unit, Saurian Flanker. 1. Drake Flameheart is promoted from a level 2 rank, Drake Flare, after the Drake Flare had reached about 64 points of experience. Its fighting capabilities are leadership, melee-blade (war blade, 11-3) and ranged-fire (fire breath, 8-4). For capabilities intelligent and resilient, its life-level is about 79 HP and has about 120 XP. 2. Inferno Drake is promoted from a level 2 rank, Fire Drake, after the Fire Drake had reached about 69 points of experience. Its fighting capabilities are melee-blade (battle claw, 12-2) and ranged-fire (fire breath, 8-6). For capabilities intelligent and resilient, its life-level is about 89 HP and has about 120 XP. 3. Drake Enforcer is promoted from a level 2 rank, Drake Thrasher, after the Drake Thrasher had reached about 76 points of experience. Its fighting capabilities are melee-blade (war talon, 11-4), melee-impact (ram, 14-3) and melee-pierce (trident, 8-5). For capabilities intelligent and resilient, its life-level is about 92 HP and has about 120 XP. 4. Drake Warden is promoted from a level 2 rank, Drake Arbiter, after the Drake Arbiter had reached about 84 points of experience. Its fighting capabilities are melee-blade (halberd, 16-3) and melee-pierce (halberd, 23-2), firststrike. For capabilities intelligent and resilient, its life-level is about 89 HP and has about 120 XP. 5. Drake Blademaster is promoted from a level 2 rank, Drake Warrior, after the Drake Warrior had reached about 56 points of experience. Its fighting capabilities are melee-blade (war talon, 16-3) and ranged-fire (fire breath, 8-3). For capabilities intelligent and resilient, its life-level is about 87 HP and has about 120 XP. 6. Hurricane Drake is promoted from a level 2 rank, Sky Drake, after the Sky Drake had reached about 64 points of experience. Its fighting capabilities are melee-impact (slam, 8-3) and ranged-fire (fire breath, 8-3), marksman. For capabilities intelligent and resilient, its life-level is about 65 HP and has about 120 XP. 7. Saurian Flanker is promoted from a level 2 rank, Saurian Ambusher, after the Saurian Ambusher had reached about 26 points of experience from . Saurian Flanker is of Saurian race but it is allied with the Drake race. Its fighting capabilities are melee-pierce (spear, 9-4) and ranged-pierce (spear, 7-2). Its other capabilities are skirmisher. For capabilities intelligent and strong, its life-level is about 48 HP and has about 120 XP. 1. Orcish Assassin costs the highest amount of gold (17 golds) to recruit. Its fighting capabilities are melee-blade (dagger, 8-1) and ranged-blade (throwing knives, 3-3), marksman & poison. For capabilities intelligent and resilient, its life-level is about 31 HP. When it reached its required level of experience (about 27 XP), it will automatically become a Level 2 unit, Orcish Slayer. 2. Wolf Rider costs 17 golds to recruit too. Wolf Rider is of Wolf race but it is allied with the Orc race. Its fighting capability is melee-blade (fangs, 5-3), magical. For capabilities and , its life-level is about HP. When it reached its required level of experience (about XP), it can become a Level 2 unit, either a Goblin Knight or a Goblin Pillager. 3. Orcish Archer costs 14 golds to recruit. Its fighting capabilities are melee-blade (dagger, 3-2), ranged-pierce (bow, 5-3) and ranged-fire (bow, 7-2). For capabilities and , its life-level is about HP. When it reached its required level of experience (about XP), it will automatically become a Level 2 unit, Orcish Crossbowman. 4. Nagini Fighter costs 14 golds to recruit. Nagini Fighter is of Nagani race but it is allied with the Orc race. Its fighting capability is melee-blade (sword, 4-4). For capabilities and , its life-level is about HP. When it reached its required level of experience (about XP), it will automatically become a Level 2 unit, Nagini Warrior. 5. Troll Whelp costs 13 golds to recruit. Troll Whelp is of Troll race but it is allied with the Orc race. Its fighting capabilities are regenerate and melee-impact (fist, 8-2). For capabilities and , its life-level is about HP. When it reached its required level of experience (about XP), it can become a Level 2 unit, either a Troll or a Troll Rocklobber. 6. Orcish Grunt costs 12 golds to recruit. Its fighting capability is melee-blade (sword, 9-2). For capabilities intelligent and resilient, its life-level is about 43 HP. When it reached its required level of experience (about 34 XP), it will automatically become a Level 2 unit, Orcish Warrior. 7. Goblin Spearman costs 9 golds to recruit. Goblin Spearman is of Goblin race but it is allied with the Orc race. Its fighting capabilities are melee-pierce (spear, 6-3) and ranged-pierce (spear, 3-1). For capabilities and , its life-level is about HP. When it reached its required level of experience (about XP), it will remain a Level 1 unit, either a Goblin Impaler or a Goblin Rouser. 8. Goblin Impaler is promoted from a level 1 rank, Goblin Spearman, after the Goblin Spearman had reached about points of experience. Goblin Impaler is of Goblin race but it is allied with the Orc race. Its fighting capabilities are melee-pierce (spear, 8-3) and ranged-pierce (spear, 5-1), firststrike. For capability slow, its life-level is about 27 HP and about 150 XP. When it reached its required level of experience (about 150 XP), it will remain as a Level 1 unit, (NO Level 2 unit) and its life-level and experience-level will both restart again from zero with higher levels to reach. 9. Goblin Rouser is promoted from a level 1 rank, Goblin Spearman, after the Goblin Spearman had reached about points of experience. Goblin Rouser is of Goblin race but it is allied with the Orc race. Its fighting capabilities are leadership and melee-pierce (spear, 6-3). For capability weak, its life-level is about 30 HP and about 150 XP. When it reached its required level of experience (about 150 XP), it will remain as a Level 1 unit, (NO Level 2 unit) and its life-level and experience-level will both restart again from zero with higher levels to reach. 1. Orcish Slayer is promoted from a level 1 rank, Orcish Assassin, after the Orcish Assassin had reached about points of experience. Its fighting capabilities are melee-blade (dagger, 10-2) and melee-blade (throwing knives, 3-3), marksman, poison. For capabilities intelligent and resilient, its life-level is about 42 HP. When it reached its required level of experience (about 120 XP), it will remain as a Level 2 unit, (NO Level 3 unit) and its life-level and experience-level will both restart again from zero with higher levels to reach. 2. Goblin Knight is promoted from a level 1 rank, Wolf Rider, after the Wolf Rider had reached about points of experience. Its fighting capability is melee-blade (fangs, 8-4). For capabilities intelligent and resilient, its life-level is about 55 HP. When it reached its required level of experience (about 52 XP), it will automatically become a Level 3 unit, Direwolf Rider. 4. Orcish Crossbowman is promoted from a level 1 rank, Orcish Archer, after the Orcish Archer had reached about points of experience. Its fighting capabilities are melee-blade (short sword, 4-3), ranged-pierce (crossbow, 8-3) and melee-pierce (crossbow, 10-2). For capabilities intelligent and resilient, its life-level is about 49 HP. When it reached its required level of experience (about 64 XP), it will automatically become a Level 3 unit, Orcish Slurbow. 5. Nagini Warrior is promoted from a level 1 rank, Nagini Fighter, after the Nagini Fighter had reached about ... points of experience. Its fighting capabilities are melee-blade (sword, 7-4). For capabilities intelligent and resilient, its life-level is about 49 HP. When it reached its required level of experience (about 53 XP), it will automatically become a Level 3 unit, Naga Myrmiden. 6. Troll is promoted from a level 1 rank, Troll Whelp, after the Troll Whelp had reached about points of experience. Its fighting capabilities are regenerates, melee-impact (club, 4-3). For capabilities ... and , its life-level is about ... HP. When it reached its required level of experience (about XP), it will automatically become a Level 3 unit, either a Troll Warrior. 7. Troll Rocklobber is promoted from a level 1 rank, Troll Whelp, after the Troll Whelp had reached about points of experience. Its fighting capabilities are regenerates, melee-impact (fist, 11-2) and ranged-impact (sling, 17-1). For capabilities and , its life-level is about HP. When it reached its required level of experience (about XP), it will remain as a Level 2 unit, (NO Level 3 unit) and its life-level and experience-level will both restart again from zero with higher levels to reach. 8. Orcish Warrior is promoted from a level 1 rank, Orcish Grunt, after the Orcish Grunt had reached about 34 points of experience. Its fighting capability is melee-blade (great sword, 10-3). For capabilities intelligent and resilient, its life-level is about 64 HP. When it reached its required level of experience (about 48 XP), it will automatically become a Level 3 unit, Orcish Warlord. 1. Direwolf Rider is promoted from a level 2 rank, Goblin Knight, after the Goblin Knight had reached about 52 points of experience. Its fighting capabilities are melee-blade (fangs, 9-4) and melee-blade (claws, 4-4), poison. For capabilities intelligent and resilient, its life-level is about 68 HP and has about 120 XP. 2. Orcish Slurbow is promoted from a level 2 rank, Orcish Crossbowman, after the Orcish Crossbowman had reached about 64 points of experience. Its fighting capabilities are melee-blade (short sword, 8-3), ranged-pierce (crossbow, 12-3) and ranged-fire (crossbow, 15-2). For capabilities intelligent and resilient, its life-level is about 63 HP and has about 120 XP. 3. Naga Myrmiden is promoted from a level 2 rank, Nagini Warrior, after the Nagini Warrior had reached about 53 points of experience. Its fighting capability is melee-blade (sword, 9-5). For capabilities intelligent and resilient, its life-level is about 56 HP and has about 120 XP. 4. Troll Warrior is promoted from a level 2 rank, Troll, after the Troll had reached about ... points of experience. Its fighting capabilities are regenerate and melee-impact (hammer, 21-2). For capabilities ... and , its life-level is about ... HP and has about XP. 5. Orcish Warlord is promoted from a level 2 rank, Orcish Warrior, after the Orcish Warrior had reached about 48 points of experience. Its fighting capabilities are melee-blade (great sword, 15-3) and ranged-pierce (bow, 8-2). For capabilities intelligent and resilient, its life-level is about 85 HP and has about 120 XP. 1. Ghost costs 20 golds to recruit. Its fighting capabilities are melee-arcane (touch, 4-3), drains and ranged-cold (wail, 3-3). Its life-level is about 18 HP. When it reached its required level of experience (about 30 XP), it can become a Level 2 unit, either a Wraith or Shadow. 2. Dark Adept costs 16 golds to recruit. Dark Adept is of Human race but it is allied with the Undead race. Its fighting capabilities are melee-cold (chill-wave, 10-2), magical and ranged-arcane (shadow-wave, 7-2), magical. Its life-level is about 31 HP. When it reached its required level of experience (about 48 XP), it will automatically become a Level 2 unit, Dark Sorceress. 3. Ghoul 16 golds to recruit. Its fighting capabilities are melee-blade (claws, 4-3), poison. Its life-level is about 33 HP. When it reached its required level of experience (about 35 XP), it will automatically become a Level 2 unit, Necrophage. 4. Skeleton costs 15 golds to recruit. Its fighting capabilities are melee-blade (axe, 7-3). Its life-level is about 34 HP. When it reached its required level of experience (about 35 XP), it can become a Level 2 unit, either a Revenant or a Deathblade. 5. Skeleton Archer costs 14 golds to recruit. Its fighting capabilities are melee-impact (fist, 3-2) and ranged-pierce (bow, 6-3). Its life-level is about 31 HP. When it reached its required level of experience (about 35 XP), it will automatically become a Level 2 unit, Bone Shooter. 6. Vampire Bat costs 13 golds to recruit. Its fighting capabilities are melee-blade (fangs, 4-2), drains. Its life-level is about 15 HP. When it reached its required level of experience (about 18 XP), it will automatically become a Level 2 unit, either Blood Bat. 7. Walking Corpse costs 8 golds to recruit. Its fighting capabilities are melee-impact (touch, 6-2), plague. Its life-level is about 18 HP. When it reached its required level of experience (about 24 XP), it will automatically become a Level 2 unit, Soulless. 1. Wraith is promoted from a level 1 rank, Ghost, when the Ghost had reached about 30 points of experience. Its fighting capabilities are melee-arcane (boneblade, 6-4), drains and ranged-cold (wail, 4-3). Its life-level is about 25 HP. When it reached its required level of experience (about 100 XP), it will automatically become a Level 3 unit, Spectre. 2. Shadow is promoted from a level 1 rank, Ghost, after the Ghost had reached about 30 points of experience. Its fighting capability is melee-blade (claws, 8-3), backstab. Its other capabilities are nightstalk and skirmisher. Its life-level is about 24 HP. When it reached its required level of experience (about 100 XP), it will automatically become a Level 3 unit, Nightgaunt. 3. Dark Sorceress is promoted from a level 1 rank, Dark Adept, after the Dark Adept had reached about 48 points of experience. Dark Sorceress is of Human race but it is allied with the Undead race. Its fighting capabilities are melee-impact (staff, 4-3), magical, ranged-cold (chill-wave, 13-2), magical and ranged-arcane (shadow-wave, 9-2), magical. Its life-level is about 54 HP. When it reached its required level of experience (about 72 XP), it can become a Level 3 unit, either a Lich or Necromancer. 4. Necrophage is promoted from a level 1 rank, Ghoul, after the Ghoul had reached about 35 points of experience. Its fighting capability is melee-blade (claws, 7-3), poison. Its life-level is about 47 HP. When it reached its required level of experience (about 150 XP), it will remain as a Level 2 unit, (NO Level 3 unit) and its life-level and experience-level will both restart again from zero with higher levels to reach. 5. Revenant is promoted from a level 1 rank, Skeleton, after the Skeleton had reached about 35 points of experience. Its fighting capability is melee-blade (axe, 8-4), submerge. Its life-level is about 47 HP. When it reached its required level of experience (about 85 XP), it will automatically become a Level 3 unit, Draug. 6. Deathblade is promoted from a level 1 rank, Skeleton, after the Skeleton had reached about 35 points of experience. Its fighting capability is melee-blade (axe, 8-5). Its life-level is about 39 HP. When it reached its required level of experience (about 150 XP), it will remain as a Level 2 unit, (NO Level 3 unit) and its life-level and experience-level will both restart again from zero with higher levels to reach. 7. Bone Shooter is promoted from a level 1 rank, Skeleton Archer, after the Skeleton Archer had reached about 35 points of experience. Its fighting capabilities are melee-blade (dagger, 6-2) and ranged-pierce (bow, 10-3), submerge. Its life-level is about 40 HP. When it reached its required level of experience (about 80 XP), it will automatically become a Level 3 unit, Banebow. 8. Blood Bat is promoted from a level 1 rank, Vampire Bat, after the Vampire Bat had reached about 18 points of experience. Its fighting capability is melee-blade (fangs, 5-3), drains. Its life-level is about 26 HP. When it reached its required level of experience (about 56 XP), it will automatically become another type of Level 2 unit, Dread Bat which has better capabilities. 9. Soulless is promoted from a level 1 rank, Walking Corpse, after the Walking Corpse had reached about 24 points of experience. Its fighting capability is melee-impact (touch, 7-3), plague. Its other capability is changing the enemy that it has killed into a walking corpse. Its life-level is about 28 HP. When it reached its required level of experience (about 150 XP), it will remain as a Level 2 unit, (NO Level 3 unit) and its life-level and experience-level will both restart again from zero with higher levels to reach. 10. Dread Bat is promoted from a level 2 rank, Blood Bat, after the Blood Bat had reached about 56 points of experience. Its fighting capability is melee-blade (fangs, 6-4), drains. Though it is still a level 2 rank, its life-level and attacking ability increase. 1. Spectre is promoted from a level 2 rank, Wraith, after the Wraith had reached about 100 points of experience. Its fighting capabilities are melee-arcane (baneblade, 9-4), drains and ranged-cold (wail, 6-3). Its life-level is about 33 HP and has about 150 XP. 2. Nightgaunt is promoted from a level 2 rank, Shadow, after the Shadow had reached about 100 points of experience. Its fighting capabilities are nightstalk, skirmisher and melee-blade (claws, 10-3), backstab. Its life-level is about 35 HP and has about 150 XP. 3. Lich is promoted from a level 2 rank, Dark Sorceress, after the Dark Sorceress had reached about 72 points of experience. Its fighting capabilities are submerge, melee-arcane (touch, 8-3), drains, ranged-cold (chill-tempest, 12-3), magical and ranged-arcane (shadow-wave, 9-3), magical. Its life-level is about 67 HP and has about 120 XP. 4. Necromancer is promoted from a level 2 rank, Dark Sorceress, after the Dark Sorceress had reached about 72 points of experience. Necromancer is of Human race but it is allied with the Undead race. Its fighting capabilities are melee-impact (plague staff, 6-3), plague, ranged-cold (chill-wave, 7-3), magical and ranged-arcane (shadow-wave, 12-2), magical. Its life-level is about 70 HP and has about 150 XP. 5. Draug is promoted from a level 2 rank, Revenant, after the Revenant had reached about 85 points of experience. Its fighting capabilities are submerge and melee-blade (axe, 12-4). Its life-level is about 68 HP and has about 150 XP. 6. Banebow is promoted from a level 2 rank, Bone Shooter, after the Bone Shooter had reached about 80 points of experience. Its fighting capabilities are submerge, melee-blade (dagger, 8-2) and ranged-pierce (bow, 14-3). Its life-level is about 50 HP and has about 150 XP. 1. Gryphon Rider costs 24 golds to recruit. Gryphon Rider is of Gryphon race but it is allied with the Dwarf race. Its fighting capability is melee-blade (claws, 13-2). Its life-level is about 33 HP. When it reached its required level of experience (about 38 XP), it will automatically become a Level 2 unit, Gryphon Master. 2. Dwarvish Guardsman costs 19 golds to recruit. Its fighting capabilities are melee-pierce (spear, 5-3) and ranged-pierce (javelin, 5-1). Its life-level is about 49 HP. When it reached its required level of experience (about 47 XP), it will automatically become a Level 2 unit, Dwarvish Stalwart. 3. Dwarvish Ulfserker costs 19 golds to recruit. Its fighting capability is melee-blade (berserker frenzy, 5-4), berserk. Its life-level is about 33 HP. When it reached its required level of experience (about 42 XP), it will automatically become a Level 2 unit, Dwarvish Berserker. 4. Dwarvish Thunderer costs 17 golds to recruit. Its fighting capabilities are melee-blade (dagger, 7-3) and ranged-pierce (thunderstick, 18-1). Its life-level is about 36 HP. When it reached its required level of experience (about 32 XP), it will automatically become a Level 2 unit, Dwarvish Thunderguard. 5. Dwarvish Fighter costs 16 golds to recruit. Its fighting capabilities are melee-blade (axe, 7-3) and melee-impact (hammer, 8-2). Its life-level is about 41 HP. When it reached its required level of experience (about 41 XP), it will automatically become a Level 2 unit, Dwarvish Steelclad. 6. Footpad costs 14 golds to recruit. Footpad is of Human race but it is allied with the Dwarf race. Its fighting capabilities are melee-impact (club, 6-2) and ranged-impact (sling, 5-2). Its life-level is about 36 HP. When it reached its required level of experience (about 36 XP), it will automatically become a Level 2 unit, Outlaw. 7. Poacher costs 14 golds to recruit. Poacher is of Human race but it is allied with the Dwarf race. Its fighting capabilities are melee-blade (dagger, 4-2) and ranged-pierce (bow, 4-4). Its life-level is about 38 HP. When it reached its required level of experience (about 29 XP), it will automatically become a Level 2 unit, Trapper. 8. Thief costs golds to recruit. Thief is of Human race but it is allied with the Dwarf race. Its fighting capability is melee-blade (dagger, 5-3), backstab. Its life-level is about 25 HP. When it reached its required level of experience (about 22 XP), it will automatically become a Level 2 unit, Rogue. 1. Gryphon Master is promoted from a level 1 rank, Gryphon Rider, after the Gryphon Rider had reached about 27 points of experience. Gryphon Master is of Gryphon race but it is allied with the Dwarf race. Its fighting capability is melee-blade (claw, 16-2). Its life-level is about 49 HP. When it reached its required level of experience (about 150 XP), it will remain as level 2 unit (NO Level 3 unit) and its life-level and experience-level will both restart again from zero with higher levels to reach. 2. Dwarvish Stalwart is promoted from a level 1 rank, Dwarvish Guardsman, after the Dwarvish Guardsman had reached about 33 points of experience. Its fighting capabilities are melee-pierce (spear, 7-3) and ranged-pierce (javelin, 8-1). Its life-level is about 57 HP. When it reached its required level of experience (about 85 XP), it will automatically become a Level 3 unit, Dwarvish Sentinel. 3. Dwarvish Berserker is promoted from a level 1 rank, Dwarvish Ulfserker, after the Dwarvish Ulfserker had reached about 42 points of experience. Its fighting capability is melee-blade (berserker, frenzy, 8-4), berserk. Its life-level is about 54 HP. When it reached its required level of experience (about 120 XP), it will remain as level 2 unit (NO Level 3 unit) and its life-level and experience-level will both restart again from zero with higher levels to reach. 4. Dwarvish Thunderguard is promoted from a level 1 rank, Dwarvish Thunderer, after the Dwarvish Thunderer had reached about 22 points of experience. Its fighting capabilities are melee-blade (dagger, 7-3) and ranged-pierce (thunderstick, 28-1). Its life-level is about 45 HP. When it reached its required level of experience (about 76 XP), it will automatically become a Level 3 unit, Dwarvish Dragonguard. 5. Dwarvish Steelclad is promoted from a level 1 rank, Dwarvish Fighter, after the Dwarvish Fighter had reached about 23 points of experience. Its fighting capabilities are melee-blade (battle axe, 12-3) and melee-impact (hammer, 15-2). Its life-level is about 60 HP. When it reached its required level of experience (about 59 XP), it will automatically become a Level 3 unit, Dwarvish Lord. 6. Outlaw is promoted from a level 1 rank, Footpad, after the Footpad had reached about 25 points of experience. Outlaw is of Human race but it is allied with the Dwarf race. Its fighting capabilities are melee-impact (mace, 8-2) and ranged-impact (sling, 6-3). Its life-level is about 40 HP. When it reached its required level of experience (about 62 XP), it will automatically become a Level 3 unit, Fugitive. 7. Trapper is promoted from a level 1 rank, Poacher, after the Poacher had reached about 16 points of experience. Trapper is of Human race but it is allied with the Dwarf race. Its fighting capabilities are melee-blade (dagger, 5-4) and ranged-pierce (bow, 6-4). Its life-level is about 52 HP. When it reached its required level of experience (about 65 XP), it can become a Level 3 unit, either a Ranger or Huntsman. 8. Rogue is promoted from a level 1 rank, Thief, after the Thief had reached about 22 points of experience. Rogue is of Human race but it is allied with the Dwarf race. Its fighting capabilities are melee-blade (dagger, 6-3), backstab and ranged-blade (knife, 4-3). Its life-level is about 42 HP. When it reached its required level of experience (about 56 XP), it will automatically become a Level 3 unit, Assassin. 1. Dwarvish Sentinel is promoted from a level 2 rank, Dwarvish Stalwart, after the Dwarvish Stalwart had reached about 85 points of experience. Its fighting capabilities are melee-pierce (spear, 9-3) and ranged-pierce (javelin, 11-2). Its life-level is about 71 HP and has about 150 XP. 2. Dwarvish Dragonguard is promoted from a level 2 rank, Dwarvish Thunderguard, after the Dwarvish Thunderguard had reached about 76 points of experience. Its fighting capabilities are melee-blade (dagger, 10-3) and ranged-pierce (dragonstaff, 40-1). Its life-level is about 60 HP and has about 120 XP. 3. Dwarvish Lord is promoted from a level 2 rank, Dwarvish Steelclad, after the Dwarvish Steelclad had reached about 59 points of experience. Its fighting capabilities are melee-blade (battle axe, 16-3), melee-impact (hammer, 20-2) and ranged-blade (hatchet, 10-2). Its life-level is about 80 HP and has about 120 XP. 4. Fugitive is promoted from a level 2 rank, Outlaw, after the Outlaw had reached about 62 points of experience. Fugitive is of Human race but it is allied with the Dwarf race. Its fighting capabilities are concealmentmelee-impact (mace, 11-2) and ranged-impact (sling, 7-4). Its life-level is about 59 HP and has about 120 XP. 5. Ranger is promoted from a level 2 rank, Trapper, after the Trapper had reached about 65 points of experience. Ranger is of Human race but it is allied with the Dwarf race. Its fighting capabilities are melee-blade (sword, 8-4) and ranged-pierce (bow, 7-4). Its life-level is about 68 HP and has about 150 XP. 6. Huntsman is promoted from a level 2 rank, Trapper, after the Trapper had reached about 65 points of experience. Huntsman is of Human race but it is allied with the Dwarf race. Its fighting capabilities are melee-blade (dagger, 5-4) and ranged-pierce (bow, 9-4), marksman. Its life-level is about 65 HP and has about 150 XP. 7. Assassin is promoted from a level 2 rank, Rogue, after the Rogue had reached about 56 points of experience. Assassin is of Human race but it is allied with the Dwarf race. Its fighting capabilities are melee-blade (dagger, 9-3), backstab and ranged-blade (knife, 5-3), poison. Its life-level is about 52 HP and has about 120 XP. 1. Horseman costs 23 golds to recruit. Its fighting capabilities are melee-pierce (spear, 10-2), charge. Its life-level is about 44 HP. When it reached its required level of experience (about 44 XP), it can become a Level 2 unit, either Knight or Lancer. 2. Mage costs 20 golds to recruit. Its fighting capabilities are melee-impact (staff, 5-1) and ranged-fire (missile, 7-3), magical. Its life-level is about 28 HP. When it reached its required level of experience (about 42 XP), it can become a Level 2 unit, either White Mage or Red Mage. 3. Heavy Infantryman costs 19 golds to recruit. Its fighting capabilities are melee-impact (mace, 12-2). Its life-level is about 37 HP. When it reached its required level of experience (about 40 XP), it will automatically become a Level 2 unit, Shock Trooper. 4. Cavalryman costs 17 golds to recruit. Its fighting capabilities are melee-blade (sword, 6-3). Its life-level is about 43 HP. When it reached its required level of experience (about 32 XP), it will automatically become a Level 2 unit, Dragoon. 5. Fencer costs 16 golds to recruit. Its fighting capabilities are melee-blade (saber, 5-4). Its life-level is about 34 HP. When it reached its required level of experience (about 42 XP), it will automatically become a Level 2 unit, Duelist . 6. Bowman costs 14 golds to recruit. Its fighting capabilities are melee-blade (short-sword, 4-2) and ranged-pierce (bow, 6-3). Its life-level is about 38 HP. When it reached its required level of experience (about 31 XP), it will automatically become a Level 2 unit, longbowman. 7. Spearman costs 14 golds to recruit. Its fighting capabilities are melee-pierce (spear, 7-3) and ranged-pierce (javelin, 6-1). Its life-level is about 41 HP. When it reached its required level of experience (about 34 XP), it can become a Level 2 unit, either Swordman, Pikeman or Javelineer. 8. Merman Fighter costs 14 golds to recruit. Merman Fighter is of Merman race but this merman rank is helping the Human race. Its fighting capabilities are melee-pierce (trident, 6-3). Its life-level is about 37 HP. When it reached its required level of experience (about 27 XP), it can become a Level 2 unit, Merman Warrior. 1. Knight is promoted from a level 1 rank, Horseman, after the Horseman had reached about 31 points of experience. Its fighting capabilities are melee-blade (sword, 9-4) and melee-pierce (lance, 15-2), charge. Its life-level is about 56 HP. When it reached its required level of experience (about 120 XP), it can become a Level 3 unit, either a Grand Knight or a Paladin. 2. Lancer is promoted from a level 1 rank, Horseman, after the Horseman had reached about 31 points of experience. Its fighting capability is melee-pierce (lance, 13-3) with charge. Its life-level is about 49 HP. When it reached its required level of experience (about 150 XP), it will remain as level 2 unit (NO Level 3 unit) and its life-level and experience-level will both restart again from zero with higher levels to reach. 3. White Mage is promoted from a level 1 rank, Mage, after the Mage had reached about 42 points of experience. Its fighting capabilities are melee-impact (staff, 7-2) and ranged-arcane (lightbeam, 9-3), magical. Its other powers are curing and healing giving 8 HP to all its member units standing next to it. Its life-level is about 36 HP. When it reached its required level of experience (about 120 XP), it will automatically become a Level 3 unit, Mage of Light. 4. Red Mage is promoted from a level 1 rank, Mage, after the Mage had reached about 42 points of experience. Its fighting capabilities are melee-impact (staff, 6-2) and ranged-fire (fireball, 8-4), magical. Its life-level is about 43 HP. When it reached its required level of experience (about 80 XP), it can become a Level 3 unit, either an Silver Mage or a Arch Mage. 5. Shock Trooper is promoted from a level 1 rank, Heavy Infantryman, after the Heavy Infantryman had reached about 28 points of experience. Its fighting capability is melee-impact (flail, 19-2). Its life-level is about 59 HP. When it reached its required level of experience (about 110 XP), it will automatically become a Level 3 unit, Iron Mauler. 6. Dragoon is promoted from a level 1 rank, Cavalryman, after the Cavalryman had reached about 28 points of experience. Its fighting capabilities are melee-blade (sword, 6-4) and ranged-pierce (crossbow, 12-1). Its life-level is about 60 HP. When it reached its required level of experience (about 95 XP), it will automatically become a Level 3 unit, Cavalier. 7. Duelist is promoted from a level 1 rank, Fencer, after the Fencer had reached about 42 points of experience. Its fighting capabilities are melee-blade (saber, 5-5) and ranged-pierce (crossbow, 12-1). Its life-level is about 45 HP. When it reached its required level of experience (about 72 XP), it will automatically become a Level 3 unit, Master At Arms. 8. Longbowman is promoted from a level 1 rank, Bowman, after the Bowman had reached about 22 points of experience. Its fighting capabilities are melee-blade (sword, 8-2) and ranged-pierce (longbow, 10-3). Its life-level is about 57 HP. When it reached its required level of experience (about 54 XP), it will automatically become a Level 3 unit, Master Bowman. 9. Swordman is promoted from a level 1 rank, Spearman, after the Spearman had reached about 29 points of experience. Its fighting capability is melee-blade (sword, 9-4). Its life-level is about 61 HP. When it reached its required level of experience (about 48 XP), it will automatically become a Level 3 unit, Royal Guard. 10. Pikeman is promoted from a level 1 rank, Spearman, after the Spearman had reached about 29 points of experience. Its fighting capability is melee-pierce (pike, 13-3), first strike. Its life-level is about 52 HP. When it reached its required level of experience (about 52 XP), it will automatically become a Level 3 unit, Halberdier. 11. Javelineer is promoted from a level 1 rank, Spearman, after the Spearman had reached about 29 points of experience. Its fighting capabilities are melee-pierce (spear, 8-3), first strike and ranged-pierce (javelin,11-2). Its life-level is about 54 HP. When it reached its required level of experience (about 120 XP), it will remain as level 2 unit (NO Level 3 unit) and its life-level and experience-level will both restart again from zero with higher levels to reach. 12. Merman Warrior is promoted from a level 1 rank, Merman Fighter, after the Merman Fighter had reached about 27 points of experience. Merman Warrior is of Merman race but this merman rank is helping the Human race. Its fighting capability is melee-pierce (trident, 10-3). Its life-level is about 56 HP. When it reached its required level of experience (about 64 XP), it can become a Level 3 unit, either a Merman Triton or Merman Hoplite. 1. Grand Knight is promoted from a level 2 rank, Knight, after the Knight had reached about 120 points of experience. Its fighting capabilities are melee-blade (long sword, 12-4) and melee-pierce (lance, 17-2), charge. Its life-level is about 75 HP and has about 150 XP. 2. Paladin is promoted from a level 2 rank, Knight, after the Knight had reached about 120 points of experience. Its fighting capabilities are melee-arcane (sword, 9-5) and melee-pierce (lance, 16-2), charge. It can also heals other units next to it by 4 HP. Its life-level is about 63 HP and has about 150 XP. 3. Mage of Light is promoted from a level 2 rank, White Mage, after the White Mage had reached about 120 points of experience. Its fighting capabilities are melee-impact (morning star, 7-3) and ranged-arcane (lightbeam, 12-3), magical. Its powers are curing and healing giving 8 HP to all its member units standing next to it. Its life-level is about 48 HP and has about 120 XP. 4. Silver Mage is promoted from a level 2 rank, Red Mage, after the Red Mage had reached about 80 points of experience. Its fighting capabilities are teleport, melee-impact (staff, 7-2) and ranged-fire (missile, 9-4), magical. Its life-level is about 52 HP and has about 150 XP. 5. Arch Mage is promoted from a level 2 rank, Red Mage, after the Red Mage had reached about 80 points of experience. Its fighting capabilities are melee-impact (staff, 8-2) and ranged-fire (fireball, 12-4), magical. Its life-level is about 58 HP and has about 220 XP. 6. Iron Mauler is promoted from a level 2 rank, Shock Trooper, after the Shock Trooper had reached about 110 points of experience. Its fighting capability is melee-impact (mace, 26-2). Its life-level is about 72 HP and has about 150 XP. 7. Cavalier is promoted from a level 2 rank, Dragoon, after the Dragoon had reached about 95 points of experience. Its fighting capabilities are melee-blade (longsword, 11-4) and ranged-pierce (cross-bow, 20-1). Its life-level is about 76 HP and has about 150 XP. 8. Master At Arms is promoted from a level 2 rank, Duelist, after the Duelist had reached about 72 points of experience. Its fighting capabilities are melee-blade (saber, 8-5) and ranged-pierce (cross-bow, 20-1). Its life-level is about 58 HP and has about 120 XP. 9. Master Bowman is promoted from a level 2 rank, Longbowman, after the Longbowman had reached about 54 points of experience. Its fighting capabilities are melee-blade (sword, 8-3) and ranged-pierce (longbow, 11-4). Its life-level is about 74 HP and has about 120 XP. 10. Royal Guard is promoted from a level 2 rank, Swordman, after the Swordman had reached about 48 points of experience. Its fighting capability is melee-blade (long-sword, 11-4). Its life-level is about 81 HP and has about 120 XP. 11. Halberdier is promoted from a level 2 rank, Pikeman, after the Pikeman had reached about 52 points of experience. Its fighting capabilities are melee-blade(halberd, 15-3) and melee-pierce (halberd, 19-2), first-strike. Its life-level is about 68 HP and has about 120 XP. 12. Merman Triton is promoted from a level 2 rank, Merman Warrior, after the Merman Warrior had reached about 64 points of experience. Merman Triton is of Merman race but this merman rank is helping the Human race. Its fighting capabilities are melee-blade (trident, 14-3) and melee-pierce (trident, 19-2). Its life-level is about 67 HP and has about 120 XP. 1. Wose costs 20 golds to recruit. Its fighting capabilities are melee-impact (crush, 13-2). Wose is of Wose race but it is allied with the Elf race. Its other abilities are ambush and regenerate itself. Its life-level is about 52 HP. When it reached its required level of experience (about 40 XP), it can become a Level 2 unit, Elder Wose. 2. Elvish Scout costs 18 golds to recruit. Its fighting capabilities are melee-blade (sword, 4-3) and ranged-pierce (bow, 7-2). Its life-level is about 32 HP. When it reached its required level of experience (about 26 XP), it will automatically become a Level 2 unit, Elvish Rider. 3. Elvish Archer costs 17 golds to recruit. Its fighting capabilities are melee-blade (sword, 6-2) and ranged-pierce (bow, 5-4). Its life-level is about 33 HP. When it reached its required level of experience (about 44 XP), it can become a Level 2 unit, either a Elvish Ranger or Elvish Marksman. 4. Elvish Sharman costs 15 golds to recruit. Its fighting capabilities are melee-impact (staff, 3-2) and ranged-impact (entangle, 4-2), slows. Its other ability is heals + 4 for injured units standing next to it. Its life-level is about 25 HP. When it reached its required level of experience (about 32 XP), it can become a Level 2 unit, either a Elvish Druid or Elvish Sorceress. 5. Merman Hunter costs 15 golds to recruit. Merman Hunter is of Merman race but this merman rank is helping the Elf race. Its fighting capabilities are melee-pierce (spear, 4-2) and ranged-pierce (spear, 5-3). Its life-level is about 34 HP. When it reached its required level of experience (about 35 XP), it can become a Level 2 unit, either a Merman Spearman or Merman Netcaster. 6. Elvish Fighter costs 14 golds to recruit. Its fighting capabilities are melee-blade (sword, 6-4) and ranged-pierce (bow, 3-3). Its life-level is about 33 HP. When it reached its required level of experience (about 32 XP), it can become a Level 2 unit, either a Elvish Captain or a Elvish Hero. 1. Elder Wose is promoted from a level 1 rank, Wose, after the Wose had reached about 40 points of experience. Its fighting capabilities are melee-impact (crush, 19-2). Elder Wose is of Wose race but it is allied with the Elf race. Its life-level is about 64 HP. When it reached its required level of experience (about 100 XP), it will remain as a Level 2 unit, (NO Level 3 unit) and its life-level and experience-level will both restart again from zero with higher levels to reach. 2. Elvish Rider is promoted from a level 1 rank, Elvish Scout, after the Elvish Scout had reached about 26 points of experience. Its fighting capabilities are melee-blade (sword, 8-3) and ranged-pierce (bow, 9-2). Its life-level is about 46 HP. When it reached its required level of experience (about 60 XP), it will automatically become a Level 3 unit, Elvish Outrider. 3. Elvish Ranger is promoted from a level 1 rank, Elvish Archer, after the Elvish Archer had reached about 44 points of experience. Its fighting capabilities are melee-blade (sword, 7-3) and ranged-pierce (bow, 8-4). Its life-level is about 48 HP. When it reached its required level of experience (about 90 XP), it will automatically become a Level 3 unit, Elvish Avenger. 4. Elvish Marksman is promoted from a level 1 rank, Elvish Archer, after the Elvish Archer had reached about 44 points of experience. Its fighting capabilities are melee-blade (sword, 6-2) and ranged-pierce (longbow, 10-4), marksman. Its life-level is about 41 HP. When it reached its required level of experience (about 80 XP), it will automatically become a Level 3 unit, Elvish Sharpshooter. 5. Elvish Druid is promoted from a level 1 rank, Elvish Sharman, after the Elvish Sharman had reached about 32 points of experience. Its fighting capabilities are melee-impact (staff, 4-2), ranged-impact (ensnare, 6-2), slows and ranged-pierce (thorn, 6-3), magical. Its other abilities are curing and healing +8 for those injured units standing next to it. Its life-level is about 34 HP. When it reached its required level of experience (about 64 XP), it will automatically become a Level 3 unit, Elvish Shyde. 6. Elvish Sorceress is promoted from a level 1 rank, Elvish Sharman, after the Elvish Sharman had reached about 32 points of experience. Its fighting capabilities are melee-impact (staff, 3-2), ranged-impact (entangle, 4-3), slows and ranged-arcane (faerie fire, 7-4), magical. Its life-level is about 39 HP. When it reached its required level of experience (about 80 XP), it will automatically become a Level 3 unit, Elvish Enchantress. 7. Merman Spearman is promoted from a level 1 rank, Merman Hunter, after the Merman Hunter had reached about 35 points of experience. Merman Spearman is of Merman race but it is allied with the Elf race. Its fighting capabilities are melee-pierce (spear, 6-2) and ranged-pierce (spear, 6-4). Its life-level is about 44 HP. When it reached its required level of experience (about 85 XP), it will automatically become a Level 3 unit, Merman Javelineer. 8. Merman Netcaster is promoted from a level 1 rank, Merman Hunter, after the Merman Hunter had reached about 35 points of experience. Merman Netcaster is of Merman race but it is allied with the Elf race. Its fighting capabilities are melee-impact (club, 6-2) and ranged-impact (net, 9-2), slows. Its life-level is about 44 HP. When it reached its required level of experience (about 80 XP), it will automatically become a Level 3 unit, Merman Entangler. 9. Elvish Captain is promoted from a level 1 rank, Elvish Fighter, after the Elvish Fighter had reached about 32 points of experience. Its fighting capabilities are leadership, melee-blade (sword, 7-4) and ranged-pierce (bow, 6-3). Its life-level is about 45 HP. When it reached its required level of experience (about 90 XP), it will automatically become a Level 3 unit, Elvish Marshal. 10. Elvish Hero is promoted from a level 1 rank, Elvish Fighter, after the Elvish Fighter had reached about 32 points of experience. Its fighting capabilities are melee-blade (sword, 8-4) and ranged-pierce (bow, 7-3). Its life-level is about 51 HP. When it reached its required level of experience (about 72 XP), it will automatically become a Level 3 unit, Elvish Champion. 1. Elvish Outrider is promoted from a level 2 rank, Elvish Rider, after the Elvish Rider had reached about 60 points of experience. Its fighting capabilities are melee-blade (sword, 7-4) and ranged-pierce (bow, 9-3). Its life-level is about 57 HP and has about 120 XP. 2. Elvish Avenger is promoted from a level 2 rank, Elvish Ranger, after the Elvish Ranger had reached about 90 points of experience. Its fighting capabilities are ambush, melee-blade (sword, 8-4) and ranged-pierce (bow, 11-4). Its life-level is about HP and has about XP. 3. Elvish Sharpshooter is promoted from a level 2 rank, Elvish Marksman, after the Elvish Marksman had reached about 80 points of experience. Its fighting capabilities are melee-blade (sword, 7-2) and ranged-pierce (longbow, 10-5), marksman. Its life-level is about 51 HP and has about 150 XP. 4. Elvish Shyde is promoted from a level 2 rank, Elvish Druid, after the Elvish Druid had reached about 64 points of experience. Its fighting capabilities are melee-impact (faerie touch, 6-2), magical, ranged-impact (ensnare, 6-3), slows and ranged-pierce (thorns, 8-3), magical. Its other abilities are curing and healing + 8 the injured units standing next to it. Its life-level is about 44 HP and has about 120 XP. 5. Elvish Enchantress is promoted from a level 2 rank, Elvish Sorceress, after the Elvish Sorceress had reached about 80 points of experience. Its fighting capabilities are melee-impact (staff, 7-2), ranged-impact (entangle, 5-4), slows and ranged-arcane (faerie fire, 9-4), magical. Its life-level is about HP and has about XP. 6. Merman Javelineer is promoted from a level 2 rank, Merman Spearman, after the Merman Spearman had reached about 85 points of experience. Merman Javelineer is of Merman race but it is allied with the Elf race. Its fighting capabilities are melee-pierce (spear, 8-2) and ranged-pierce (spear, 10-4). Its life-level is about 59 HP and has about 150 XP. 7. Merman Entangler is promoted from a level 2 rank, Merman Netcaster, after the Merman Netcaster had reached about 80 points of experience. Merman Entangler is of Merman race but it is allied with the Elf race. Its fighting capabilities are melee-impact (club, 9-3) and ranged-impact (net, 8-3), slows. Its life-level is about 53 HP and has about 150 XP. 8. Elvish Marshal is promoted from a level 2 rank, Elvish Captain, after the Elvish Captain had reached about 90 points of experience. Its fighting capabilities are leadership, melee-blade (sword, 10-4) and ranged-pierce (bow, 9-3). Its life-level is about 59 HP and has about 150 XP. 9. Elvish Champion is promoted from a level 2 rank, Elvish Hero, after the Elvish Hero had reached about 72 points of experience. Its fighting capabilities are melee-blade (sword, 9-5) and ranged-pierce (bow, 10-3). Its life-level is about 70 HP and has about 120 XP. I have completed all the Novice Story Line using the easy level of difficulty. Heir to the Throne : This story has 25 scenarios as stated in the game. However, when I completed, I counted only 23 battle scenarios. 2 scenarios which just give part of the story but no battle are also considered scenarios. (WALK and REINFORCE). This is about a Konrad that was saved by an elf brought up in elven woods and trained by Delfador. Delfador is a loyal mage of King Garard who was betrayed by his son and his wife, Queen Asheviere. Therefore, it is mainly Elves and 2 Humans (in the beginning), Mermen then Dwarves (during mid story) and Outlaws against Orcs Undead and Human. 4. Bay of Pearls : at end of this scenario, you can choose to take a route using (A) ship or (B) walk. I chose to WALK. 5. Muff Malai's Peninsula if walk or Isle Of The Damned if ship and will be aided by Mermen. 6. The Seige of Elensefar : you must select whether the outlaw will (A) help you infiltrate the City or (B) reinforce you army after entering the enemies fort. I chose REINFORCE. The game will continue in this scenario until it battle is won. This storyline has a few storylines following it. One of them is 'The South Guard' which is about a knight fighting against rebels / outlaws and undead. Another storyline following this is 'Liberty' about becoming outlaws and bandits to fight against the evil Queen. Another storyline following it is 'The Eastern Invasion' about . A Tale of Two Brothers : This story has 4 scenarios as stated in the game. This is about a human brothers, Arne fighting to free his brother, Bjarn from captivity by Undead and Orcs. The time of this storyline is near the storyline 'Legend of Wesmere'. An Orcish Incursion : This story has 7 scenarios as stated in the game. This storyline is a continuation of 'The Rise Of Wesnoth'. It is about one elf lord, Erlormas who grew up during the time when Prince Haldric established Wesnoth. When he saw the orcs near his outpost, he knew he had to destroy them as the orcs are trees cutter. This storyline will give some tips on what how to fight the different enemies. So, this is a good storyline to start with. 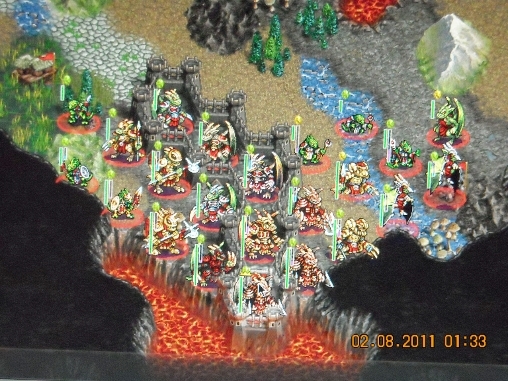 In the first scenario, the elves have to fight orc-fighters and orc-archers. In the second scenario, the elves have to fight orcish-slayers which use poison. 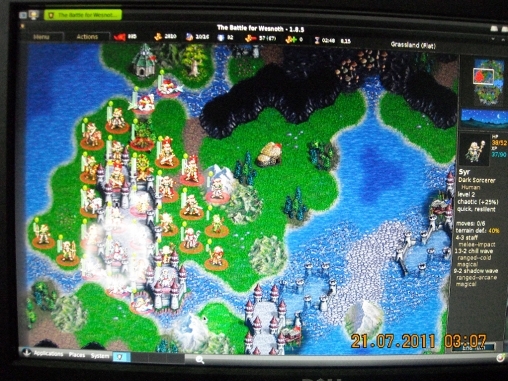 In the forth scenario, the elves have to fight trolls. In the sixth, the elves have to fight undead. As I am already pretty good at playing this game, I could get through this storyline easily without having to cheat in fights. Maybe once or twice, I let the computer play again because the enemy fought to good and I knew about the danger. I could finish two novice storylines, this and 'The South Guard' in 24 hours including my break and sleeping time. The South Guard : This story has 9 scenarios if you chose to kill the outlaws. However, if you choose to fight with the bandit against the undead, there are 8 scenarios only. This storyline is a continuation of 'Heir to the Throne'. It is about a young human commander, Deoran who was made by Konrad, King Haldric VII to be the commander in South Guard because the King had not heard from him for 2 weeks. So, this young commander has to fight Orcs and Undead to find out what happened. 5. Choice in the Fog : in the mid of this scenario, you can choose to fight (A) with Outlaw or (B) kill Outlaw and fight with elves. I chose to Kill Outlaw and fight with elves. If you chose to kill outlaws in scenario 5 (Choice in the Fog), there will be 9 scenarios in total as shown below. 7. Into the Depths : in the mid of this scenario, player will meet Trolls which player must make as ally. Player will have to choose either to (A) give 100 gold or (B) offer land. I chose to to GIVE 100 GOLD. However, if you chose to fight together with outlaws in scenario 5 (Choice in the Fog), there will be 8 scenarios only in total as shown below. Liberty : This story has 9 scenarios as stated in the game. However, when I completed, I counted only 8 battle scenarios. 1 scenario which just gives part of the story but no battle is also considered scenario. This is about Human becoming Outlaws to protect themselves against Orcs, Undead and Humans. 6. The Grey Woods : at end of this scenario, you can choose to (A) take gold or (B) send man or (C) join. I chose to TAKE GOLD. 9. Epilogue (no battle, just story) Descent into Darkness : This story has 11 scenarios as stated in the game. This is about young apprentice mage that was kicked-out by its council. He then learned the magic from a dark sorceror to fight Orcs (who killed his father), Human (who disapproved him of learning dark magic) and anything that stood in his way against the Orcs. 10. Endless Nights : Fought and won 5 times (against Elves, Dwarves, Humans, Assassins, Orcs) and it kept repeating. No end. Cannot get to Level 11. Note : However, I still to get a crown because the software considered I have completed the whole storyline. Legend of Wesmere : This story has 17 playable scenarios as stated in the game. I could not finished the story because I could not get through the "Breaking the Siege" scenario. 17. The Eastern Invasion : This story has 18 scenarios as stated in the game. The Hammer of Thursagan : This story has 13 scenarios as stated in the game. This storyline is a continuation of 'Sceptre Of Fire'. 13. Epilogue Delfador's Memoirs : This story has 23 scenarios as stated in the game. This is about a human mage when he was young, learning . He had to fight mainly the Orcs and Undead. His ally was sometimes Humans (he served the King) and sometimes Elves. Sceptre of Fire : This story has 9 scenarios as stated in the game. I have completed this game and it has 9 playable scenarios, 3 no battle scenarios and one epilogue. This storyline is a continuation of 'The Rise Of Wesnoth'. It is about the making of Sceptre of Fire. Prince Haldric who became the first king of Wesnoth had a son named King Haldric II. King Haldric summoned his man to make a deal with dwarf to make a sceptre that could contained the bad effect of the Ruby of Fire without affecting the power of the Ruby. The King's man made a bargain with Rugnur, a dwarf who has to take the king's man with him to see a dwarf sage crafter by the name of Thursagan. Before the sceptre could be made, they have to gather materials, find the crafer and fight elves who were chasing after them for trespassing as the elves claimed. In caves, they have to fight undead, trolls and orcs. The Sceptre of Fire was buried underground in a cave after the volcano erupted in the last playable scenario, 'Caverns of Flame'. Everyone including Rugnur and Thursagan were killed by the lava. However, a gryphon named Kwack that went with them managed to fly out from the volcano and survived to tell King Haldric II that a sceptre was really made but got buried in the cave of the volcano that erupted. This is how this storyline ended. Following this storyline is 'The Hammer of Thursagan', an intermediate level storyline. Under the burning Sun : This story has 11 scenarios as stated in the game. This storyline is totally different from the others. It is about elves living in desert environment after a meteor shower. Son of Black-Eye : The game said this story has 18 scenarios but I have completed the game and counted 17 scenarios and 1 epilogue. It is orcs fight against almost every race including its own race except trolls ans saurians. This storyline is about an orc called Kapou'e who was son of Black-Eye, a great orc leader who was assassinated on the way to meet human council which was their ally at that time. There was no witness so there was speculation that humans did that to weaken them. In the first scenario, human were already ready to attack them. In 'Towards Mountain of Haag', a group of Troll appeared to help Kapou'e escaped from dwarves attack. A Prince Troll named Gruu joined Kapou'e in his quest and became his most loyal ally. This enable Kapou'e to recruit Trolls. Kapou'e has to fight elves in 'The Seige of Barag Gor'. Kapou'e has to fight undead in 'To the Habour of Tirigaz'. Kapou'e has to fight some scorpians and outlaws in 'The Desert of Death'. In 'Silent Forest', Kapou'e has to fight some trees and elves. In 'Saving Inarix', Kapou'e has sacrifised one unit to end the game. When Inarix, a saurian leader appeared in mid of game, player will have control of those saurians. With Inarix, Kapou'e could recruit saurians in the furture scenarios. In 'Clash of Armies', Kapou'e has to fight many different races such as human, elves, dwarves and merman. In the final scenario 'Northern Alliance', Kapou'e with the help of his loyal orc friends (2 orcs group) and King Howgarth III, he has to battle with Earl Lanbec'h, a human and his orcs ally, Shan Taum the Smug. Player play Kapou'e only. All the other groups are played by computer. Note : This is quite easy for an expert level storyline. However, I did not have much money left. The toughest would be 'Back Home' where your enemy is just outside your camp. Player will have very limited space to move. Anyway, it is winter the scenario so everyone could not move fast. Orcs are easy to play because the life level are high for level 1 orcs. Also Trolls can regenerate. So, for new exper level player play this storyline first. Northern Rebirth : This story has 14 scenarios including Epilogue. I completed this storyline once only. It is human fight mainly against orcs and some undead group. A leader of Orc slaves becoming the prime person of an new alliance where humans, dwarves and elves tried to keep peace and order in the north. Aggresive orcs will be subdued and cooperative ones will be taken into their alliance. His undead friends will be left in peace and protected from outsider. His drake friends back to its own kind. This storyline is about Tallin and his farmer friends, Human, that were born into families captured and enslaved by Orcs or many decades. They decided to fight for their freedom after Konrad defeated a few orcish leader in their area. Tallin befriended a red mage, found the dwarf leader of Dwarven Door in 'Infested Caves'. Then, he was given dwarves to recruit in 'To The Mines' and 'Clearing the Mines' by the dwarf leader, Hamel. In 'The Pursuit', Tallin befriend an undead, freed two human white mages, a drake and an elf but could not recruit dwarf anymore because Hamel was not with him. In 'Settling Disputes', Tallin befriended another dwarf leader, Stalrag, after he save the dwarf leader from two very powerful undead who also became Tallin's ally after Tallin defeated them. Stalrag gave Tallin ability to recruit dwarves. The two undead gave Tallin the ability to recruit gryphons. Actually, Tallin wanted to make friends with the two undead because he wanted to save an elvish princess in 'Elvish Princess' and not let the orcs collect ransom from the elves. The drake that Tallin rescued, Krash, went away for a short while to find his friend in 'Stolen Gold'. He came back with two loyal friends and gave player another group to control with its leader, Krash to recruit its own drakes which are not under Tallin. In 'Get The Gold', Tallin got one elf ally group of Elf Princess with its leader named Sisal. Sisal with the Elf Princess will give player a third group to control with its leader, the Elf Princess to recruit her own army which is not under Tallin. Note : This is the most difficult storyline to play. However, if you have lots of money, then it should not be difficult. 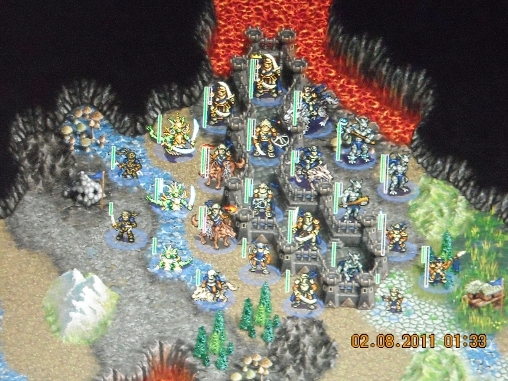 I had a lot of maney but I wanted to have an army with lots or high level warriors. So, I did not recruit much but cheated a lot. The Rise of Wesnoth : This story has 25 scenarios and one Epilogue. It is human fight mainly against outlaws, orcs, undead, drakes and saurians. This storyline is about Prince Haldric, a human from the north in Green Isle. He had to leave his land, an island, because it was attacked by orcs and lost. He had to run away to look for help. However, almost all the places he went to were also attacked or already taken over by orcs and allies (saurians). He helped elves in a new land to get rid of their foes and got a a piece of land in return. He named his new land Wesnoth. In 'The Fall' scenario, player will be asked to choose either (A) to make outlaws their ally or (B) do not trust the outlaw (do not take outlaw). Even if you choose not to trust the outlaw, the outlaw, Lady Jessene of Wesfolk will become an ally in the 'Return To Oldwood' scenario. In 'Harrowing Escape' scenario, player will get a dwarf ally if you went wondering around. At the end, player will be asked to choose either (A) River Road (Go through 'Swamp of Esten' scenario) or (B) Midlands ('Midlands' scenario). In 'Swamp of Esten', player will fight against undead and can find a mage ally if you went wondering around. In 'Midlands', you will not get any new ally. In 'A Final Spring' scenario, merman will become your ally as they are outlaws ally. In 'A New Land' scenario, Prince Haldric and gang reached a very large continent where they meet Elves and Dwarves going to fight. However, the Elves and Dwarves decided they would attack human first, then settle their issue. Lucky for Haldric, one elder Elf took him to their Kalian for a meeting. There, the elvish elders told Haldric that he has to fight four battles for them in four different places. In return, he will be given a big area of land around the Great River banks. Those four places are 'The Dragon', 'Lizard Beach', 'Curse Isle' and 'Troll Hole'. Player can choose which he/she wants to play first. If you were to ask me which is easier, I would say 'Cursed Isle' (against undead as undead has lower life level) and 'Troll Hole' (against Trolls and one spider). In 'Cursed Isle' you may find a witch. If you kill the witch the scenario will end. If not, you have to kill all the enemy leader. I found that if you finished at lower turn, you will get more money in the beginning of next scenario because the bonus finish gold is higher than the the positive gold you have. If you did not go to the spider route, it won't come out. Also, the order of scenarios that you choose will affect where the Trolls and spiders will be. The 'The Dragon' and 'Lizard Beach' are difficult as saurians can summon many 'Muds' which you must not kill. However, if you know who to recruit, they wil summon less 'Muds'. In 'Curse Isle', there can have 'Muds' but very few (1 or 2, maybe because of my recuits too). The Rise of Wesnoth scenarios. I have completed this storyline and below are all the scenarios. I completed this storyline 3 times, once the midlands with outlaw and twice taking the river road with and without outlaw. 15. A New Land no need to fight. Will go Kalian. 16. The Kalian no battle. Every successful task from scenario 17 to 20 will return to Kalian. Altogether, there will be 5 visits to Kalian. Note : This is the start of this software story because it was Prince Haldric which started the land called Wesnoth in the Epilogue. This story showed how Wesnoth started and what might become of it. Also, there is a little humour in this story line. I think this the second most difficult storyline to play. As this is the first storyline of this game, it has a few main storylines following it. One of the storyline is 'Sceptre Of Fire', an expert level storyline about dwarves, the masters of weapon making. The second storyline following this is about elf in 'An Orcish Incursion', an novice level storyline. These two are the immediate storylines after 'The Rise of Wesnoth'.